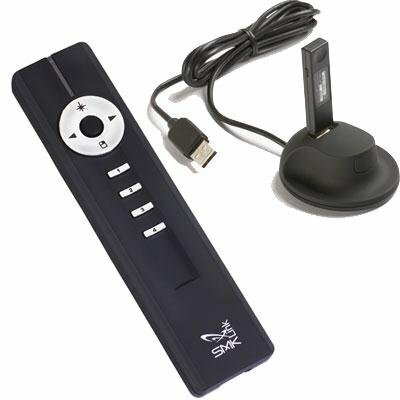 SMK-LINK VP4910 Wireless Presentation Remote Control with mouse control and Green Laser...The RemotePoint Jade offers a bright green laser pointer, full mouse functionality and presentation controls at ranges up to 150 feet. In addition to dedicated presentation controls for Mac and PC, RemotePoint Jade offers four custom buttons which can be programmed to send a variety of key combinations. Jade simplifies setup by using Auto RF, a frequency agile protocol to ensure reliable communication in today's electronically noisy environments. Compatible with Windows 7.